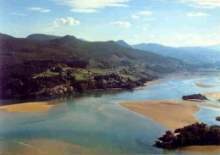 The beautiful Basque region of Bizkaia, and the estuary of the Ria Gernika. The town of Gernika lies just out of the photo on the right. 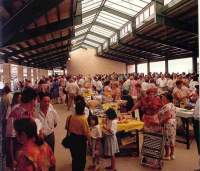 The regional market in Gernika has been entirely rebuilt in the decades since the 1937 attack, and every Monday it remains the focus of activity in the modern and once-again thriving town. The sacred oak tree of Gernika, beneath which Basque leaders and Spanish kings have sworn to uphold democratic rights for centuries. The tree and the adjacent assembly hall miraculously survived the German Luftwaffe's attack. The 17th-century building at No. 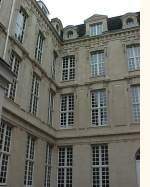 7, rue des Grands-Augustins in Paris where Picasso lived and worked for many years. He painted Guernica in a high-ceilinged second-floor studio. Although the Spanish Pavilion of the Paris world's fair was dismantled at the end of 1937, an exact replica was reconstructed in Barcelona in 1992 and the building now serves as a research library. Guernica was displayed against the far wall in the courtyard of the original Spanish Pavilion at the Paris world's fair. Alexander Calder's mobile fountain, "Spanish Mercury from Almadén," occupied much of the concrete floor in the foreground. 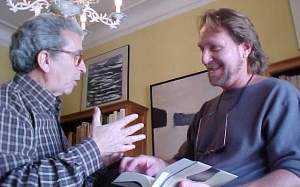 The author reconnects with his teacher Angel Vilalta, who he had not seen in thirty years. Back in 1968, Sr. Vilalta wanted his American students to view "el Guernica" for the first time only after they had learned about the Spanish Civil War and understood the genesis of the painting. 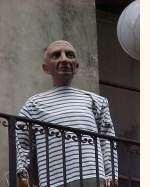 During the Festes de La Mercè in Barcelona in late September 2001, the city's favorite son appeared to return to life to enjoy the celebration. After six decades of travel, Guernica now resides at the Museo Nacional Centro de Arte Reina Sofía in Madrid, and officials say it is too fragile ever to travel again. Because of Guernica's presence, the Reina Sofía now receives more visitors than does the famed Museo del Prado. The author visits the Musée Picasso in Paris, which together with the Museu Picasso in Barcelona and the Museum of Modern Art in New York, houses the world's largest collections of the artist's work. Research assistant Patricia Benito explains the Basque perspective on current ETA terrorist activities. 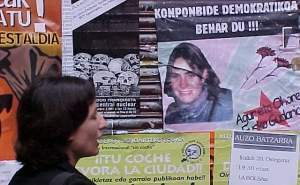 The photo of the young woman in the group of posters on a wall in Bilbao is that of a Basque separatist killed while making a bomb. A political poster in Bilbao references the imagery of Guernica. Hundreds of causes and political movements have made use of the painting's distinctive images and symbols from the 1930s up to the present time. 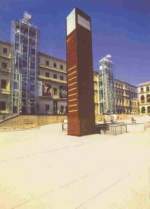 The citizens of the town of Gernika have installed a ceramic replica of the painting on a wall near the Basque assembly hall. 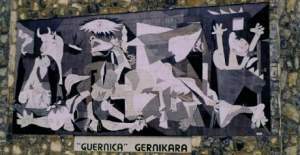 "Guernica in Gernika," read the words in Basque below. 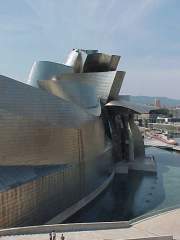 The Guggenheim museum in Bilbao, where American architect Frank Gehry is reported to have pointed out the gallery "where Guernica will hang," to King Juan Carlos and Queen Sofía of Spain during a private tour. 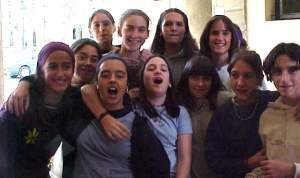 A group of schoolgirls in Gernika, who reported that their town was famous for football, beautiful boys, the sacred oak, and oh, yes, a painting by Picasso from very long ago. Although the psychology of enmity is such that enemies often are hated from generation to generation, victims of terrible violence also express an equally powerful and enduring kinship with those who similarly have suffered whether in Gernika, New York, or elsewhere around the world.